We chose the cruise for the destination as we wanted to be in Sydney for the New Year Celebration and the cruise ended on December 30th. I was very disappointed in the Lotus Spa on this ship. I booked a 90 minute massage and upon my arrival was shown to the co-ed “relaxing” area. This was not a spa atmosphere - more like a doctor’s office waiting room. No nice bathrooms to relax in, not even in the treatment room. Totally co-ed. No free use of whirl pool, sauna or steam room, but you could buy a week pass for $199 to use them (The Enclave”). Was told by spa personnel that this ship wasn’t like the other Princess ship spas and they needed to control the amount of people using the spa whirlpool, etc and that is why they charged for them. However, the message was wonderful! Just wish I could have relaxed before my message. Felt very disappointed about that. Hollywood Pool Club was Adult only, no charge and it was lovely. Very relaxing and serene and no charge. I just chose to lounge and read a book. We did pay extra for Club Class but did enjoy not having to wait at all for a table for anytime dining. It was really nice to have a special section reserved for Club Class. The waiters were phenomenal! We sailed over Christmas and felt that they did a wonderful job with Christmas decorations and celebrating Christmas. Christmas Carols were sung and everyone joined in. On Christmas morning Santa appeared in the atrium and had a gift for every child under 12 yrs. Every child got to take pictures with Santa and his helpers. It’s a beautiful ship but felt crowded in the corridor the public areas. Personally, too big of a ship for me. Will definitely use Princess again but will sail on the smaller ships. Our ages are 59-65. We chose the cruise for the destination as we wanted to be in Sydney for the New Year Celebration and the cruise ended on December 30th. I was very disappointed in the Lotus Spa on this ship. I booked a 90 minute massage and upon my arrival was shown to the co-ed “relaxing” area. This was not a spa atmosphere - more like a doctor’s office waiting room. No nice bathrooms to relax in, not even in the treatment room. Totally co-ed. No free use of whirl pool, sauna or steam room, but you could buy a week pass for $199 to use them (The Enclave”). Was told by spa personnel that this ship wasn’t like the other Princess ship spas and they needed to control the amount of people using the spa whirlpool, etc and that is why they charged for them. However, the message was wonderful! Just wish I could have relaxed before my message. Felt very disappointed about that. Hollywood Pool Club was Adult only, no charge and it was lovely. Very relaxing and serene and no charge. I just chose to lounge and read a book. We did pay extra for Club Class but did enjoy not having to wait at all for a table for anytime dining. It was really nice to have a special section reserved for Club Class. The waiters were phenomenal! We sailed over Christmas and felt that they did a wonderful job with Christmas decorations and celebrating Christmas. Christmas Carols were sung and everyone joined in. On Christmas morning Santa appeared in the atrium and had a gift for every child under 12 yrs. Every child got to take pictures with Santa and his helpers. It’s a beautiful ship but felt crowded in the corridor the public areas. Personally, too big of a ship for me. Will definitely use Princess again but will sail on the smaller ships. Our ages are 59-65. The cabin itself was wonderful. Loved the bedding, towels, amenities. Great cabin steward! The downside is the location of the cabin. It was 2 decks down from The Skywalk and people walking on The Skywalk could see us on our balcony. Also, we could literally look up and see up girl’s short skirts when they walk above us! The Sky Walk has a blue glow that stayed lit all night and shone in our room and the Sky Walk obstructed our night time balcony viewing. 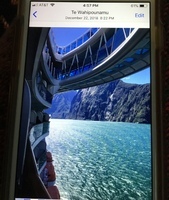 When we were in New Zealand we wanted to enjoy sitting out on our balcony and enjoy the fjords but they were partially obstructed by the Skywalk. We had little to no privacy on our balcony. Was very disappointed about that. We loved the Club Class Mini Suite, but this cabin (and all other cabins under the Sky Walk) should be labeled partially obstructed. Also the noise from Deck 16 was heard both inside the cabin and as well as outside on our balcony. Arrived Auckland at 5:10am and toured city on our transfer bus to the ship. Nice lunch of meat pie. It was piping hot and delicious. There were 4 different thermal spring pools - ranging from very hot, hot, hot and very warm and warm. I chose the hot and enjoyed it immensely. Definitely wash out your bathing suit as the sulphur water is quite odorous. Enjoyed it tremendously but not for those that aren’t physically active. Wind kicked up quite a bit when going across the Bay Area so not for those who aren’t up for that.